It seems that these days everyone is working hard and waiting for their ship to come in. Well, the wait for this one is over! The Ships Rations has arrived on golden sails, its cargo hold loaded with fine ale! 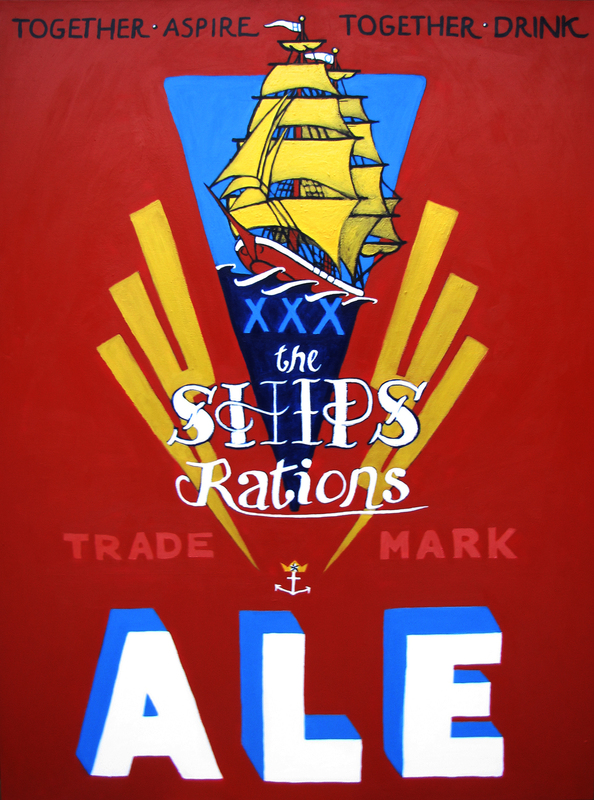 The Ships Rations painting draws upon the look and feel of vintage Canadian beer labels crossed with classic comic book covers! The image of The Ship is inspired by old-school tattoo culture, as well as the nautical imagery so common in beer labels and around The Ship herself. The colors Blue and Gold are the colors of the City of Hamilton, found on her flag, which is why this ship has golden sails on a blue sky. The inverted blue triangle upon which the ship sails represents Hamilton Harbour. The motto: “Together Aspire Together Drink” is a bit of a tongue-in-cheek play on the Hamilton motto “Together Aspire Together Achieve”. It nicely captures both the aspirational mood of modern Hamilton as well as the important (and often-overlooked in the craft beer world) social aspect of beer. Of course, it also reflects our own aspirations and hopes that we harbour, together, for The Ships Rations, The Ship, and the City of Hamilton! Here’s to all of your aspirations! Cheers!